Back in November I took a road trip. I went alone back into the past. Back to the first few years of my college days. Coming out of High School I was convinced I wanted to be a Structural Civil Engineer and make sure that tall buildings didn't fall down. I was relatively intelligent as a kid and as long as equations and math were involved I could go wherever I wanted. The sun was shining when I visited Carnegie Mellon in Pittsburgh, so that's where I went. Coming from Indianapolis, a flat city whose skyline, until shortly before that time, had been limited by height restrictions relative to a monument in the center of town, Pittsburgh was a revelation. Built on top of low rolling mountains dipping into three river valleys was a wide array of architectural styles that spanned 100 years of sky scraper development. I loved the place. At the time Pittsburgh was doing some searching as to where it was going as a place, the steel mills it was known for were being torn down all through the Monongahela valley. High tech research facilities for Westinghouse and Bayer in the suburbs seemed to be the call of a new future. Academically, the first year at CMU went off without much drama, I tended to work as hard as I needed in order to be above average and that was fine with me. Along the way there was an episode that spoke of things to come. Around Thanksgiving, a very good friend of mine was found sitting in the dormitory shower playing with razor blades. A couple days later her parents came and she went home. After the following summer, heading back in the fall, I came back to find myself alone. Many other friends found themselves with their funding pulled or just simply sick of the place. No one was happy and so they didn't come back. On my own I found myself descending into my own massive depressive episode. One Saturday morning I woke up and decided it was time. I started walking down Forbes ave to the Panther Hollow bridge that separated Shadyside and CMU from Oakland and U Pitt and I was going off the bridge. Coming down Moorewood was Mary Beth, a freshman co-worker at dining service, and not yet cynical to everything. She asked if I wanted to head over and get some lunch, maybe walk into Shadyside. I looked down the street to the bridge and I looked at Mary Beth. I went with Mary Beth. A few days later I headed home. A few years ago I discovered a co-worker of mine happened to be in my class at CMU, though we didn't know each other at the time. She was in a different school than mine, in fact upon graduation she was it's Valedictorian. We talked about the school and discovered we had a lot of bad memories in common. She was able to finish, but once she graduated she never went back either, never joined the alumni club, nor sent checks to the general fund. I recently completed a piecemeal transition of changing careers and caring for my mother as she passed away. I am as happy in my new career teaching Stats at a local university as I have ever been. As I talk with students who are having their own struggles, my past at CMU starts to make some sense to me. It prepared me to be able to listen to kids today. In November I decided it was time to go back and of course I took my camera. Things change over the course of 30 years, that is to be expected. Some of the things that changed had some personal meaning. The Panther Hollow and Schenley Park bridge now had jumper fences. The open 8 story staircase in Wean Hall known as "Architects Leap" had been filled in as a framed drywall shaft from top to bottom. The joke, stops being a joke the more people it inspires and talent it wastes. I could spend another 1000 words writing about the pictures, but I wont. I have the Iconic CMU shot of Hammerschlag hall with the U Pitt Cathedral of learning in the back ground. I replicated some pictures I took as an 18 year old with a roll of B&W film (the old apartment building reflected in the glass of a 1960's era office building and the view of Midtown tower peeking through the steel buildings that now dwarf it. 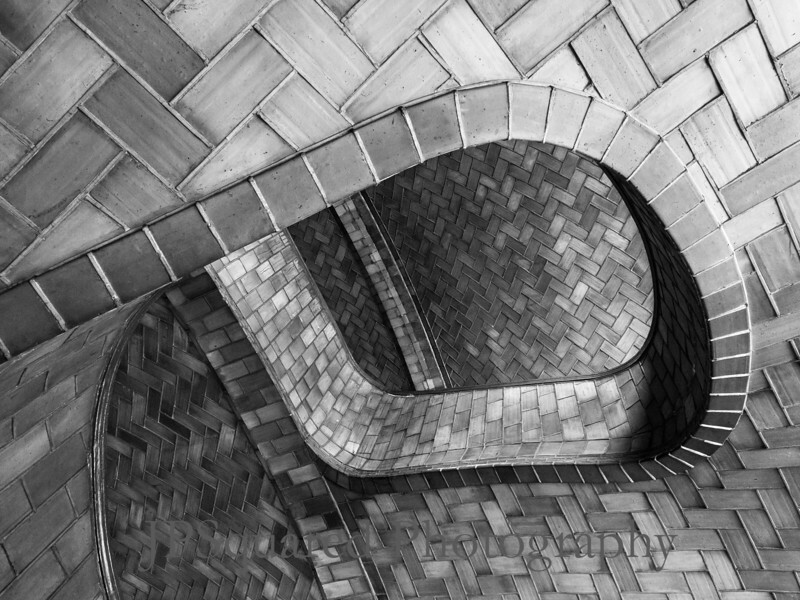 I consider the upwards look through the tile stairwell in Baker Hall to likely be the best picture I took last year. The ones that make me happiest though are the three pictures of the jumper fence on the Schenley Park bridge. No longer a place for desperate college kids to waste the future, but a place for lovers to lock locks and dream of the happiest of tomorrows.